The weather has been a bit cold lately. When it becomes chilly, I long for warm soup. Warm and comforting. I found two red kuri squashes hidden in the back of my fridge. Long forgotten from my farmer’s market trip back in December. 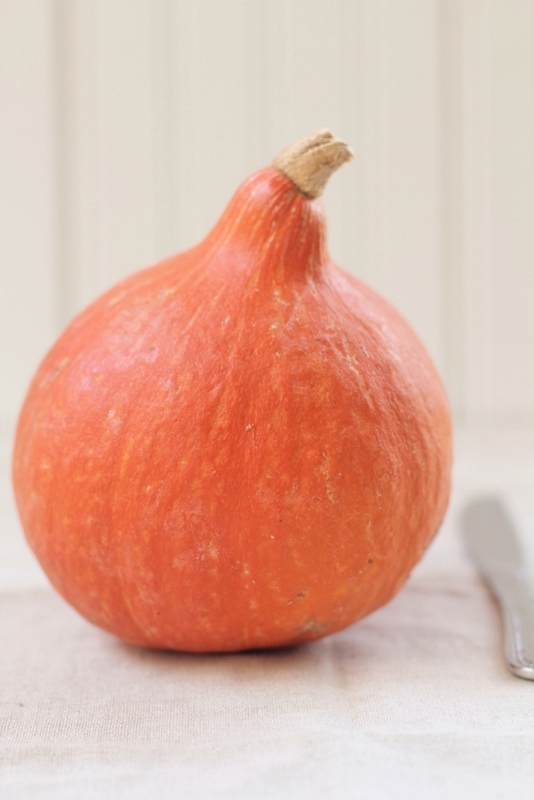 Red kuri squash looks similar to a small pumpkin. It has thick orange skin but lacks defined ridges. 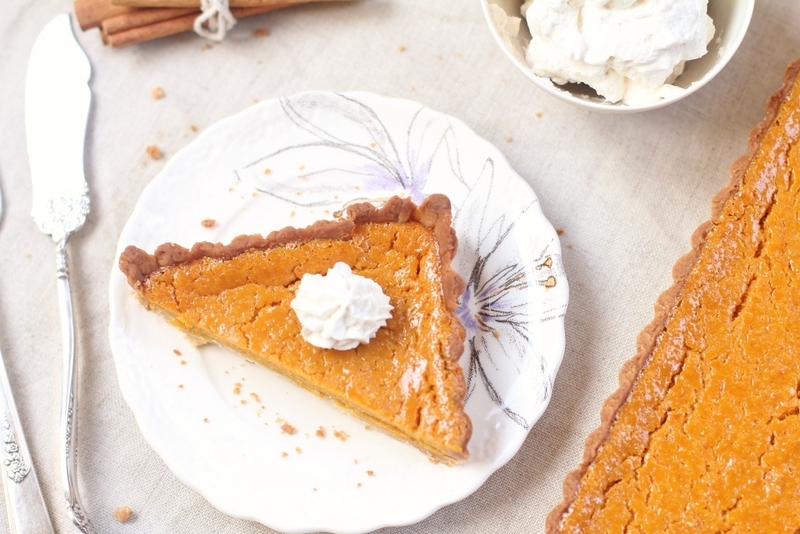 The taste is a marriage between butternut squash and sweet potato. I like roasting the kuri squash with a bit of butter until it caramelizes to get the sweet and starchy flavor and it is not a struggle removing the flesh from the skin. Two kuri squashes would yield too much soup so I decided to use the second one for a tart. I have never made a tart from scratch and decided to adapt the recipe for tart dough from Martha Stewart’s Baking Handbook. It was a workout rolling the dough. It took me hours to finally create a piece of dough that fitted my tart pan. I had to roll out 4 smaller rectangles of dough and pieced them together. The next few days, my forearms remained sore, like I had played tennis for the first time in months. I could barely hold my toothbrush. I decided to be adventurous and added mascarpone cheese to my tart recipe. All my hard work was paid off handsomely. The soup was light, delicious, and comforting. Perfect for a cold, chilly afternoon. I slurped up the bowl of soup while wrapped up in a thick blanket. Then I moved onto the tart. It reminded me of pumpkin pie but tasted more nutty with a mousse like consistency, probably the doing of the mascarpone cheese. What a satisfying meal! This was my first time cooking with red kuri squash and I cannot wait to try it in future recipes. 1. 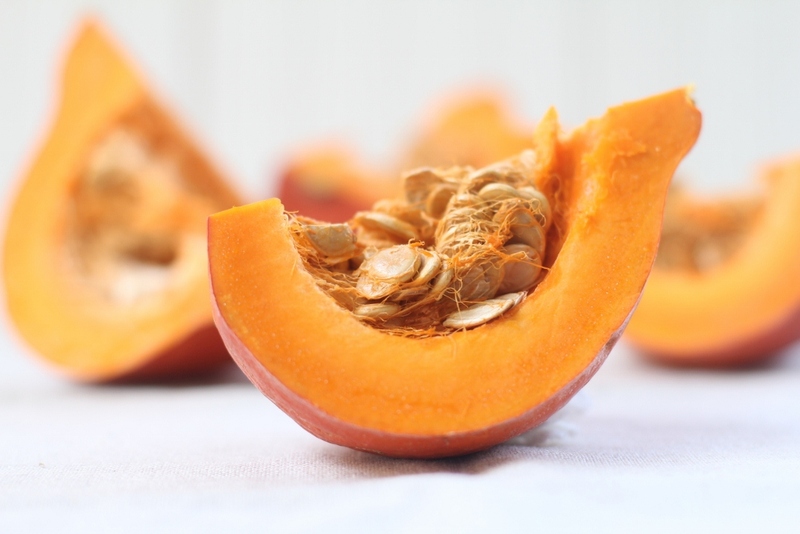 Cut the kuri squashes into quarters and scoop out the seeds. 2. Place the squash pieces, cut-side up onto a baking tray. 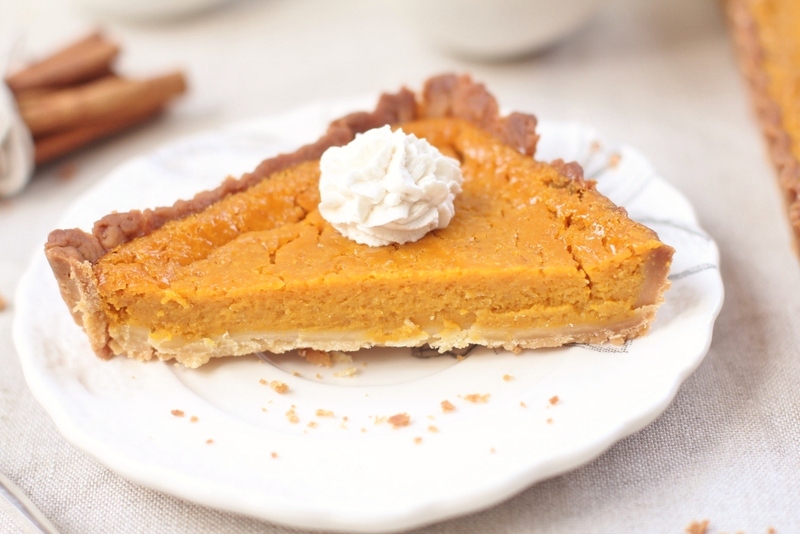 Drizzle with butter and bake for 45-60 minutes at 400˚F or until the squash is soft and starts to brown. 1. In a sauce pan, add the butter and sautee the onion on medium heat until golden brown. 2. Add the sautéed onion and squash puree to a blender and blend until smooth. 3. Return the blended squash and onion to the saucepan. Add the chicken stock and bring to a boil. 4. Add heavy cream and sugar and continue stirring. Let it simmer gently to let the flavors meld, about 15 minutes. 5. Season to taste with salt and pepper. Keep warm until ready to serve. 6. Place the pancetta pieces in the oven until the meat becomes just crunchy. Cut the roasted pancetta into small pieces. 7. Ladle the soup into serving bowls. 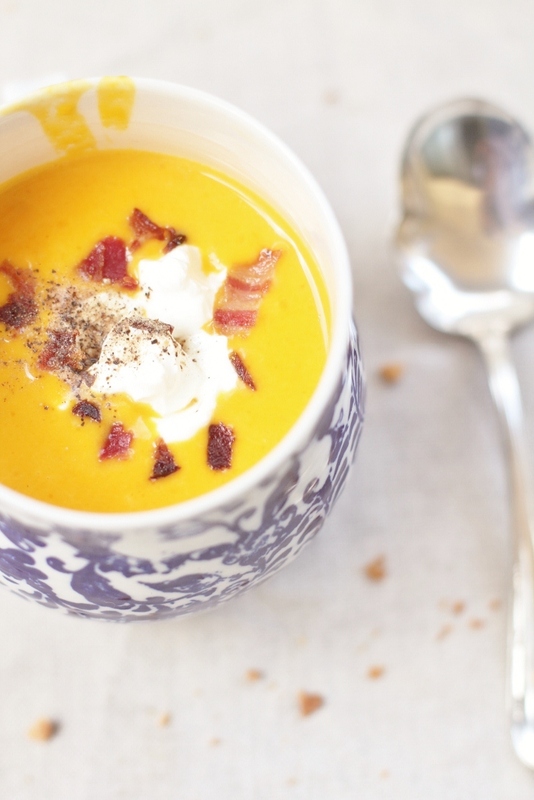 Add a few pieces of pancetta to the soup. Garnish with a tablespoon of sour cream and pepper. 2. In a bowl of an electric mixer fitted with the paddle attachment, beat the powdered sugar and butter together until creamy. 3. Add egg yolks and mix until well incorporated. 4. Add ¾ cup of flour and mix on low speed until combined. Add the remaining ¾ cup of flour and salt and beat until the flour is combined. 5. Turn the dough onto a piece of plastic wrap and shape into a flattened disk. Wrap the dough and refrigerate for at least 2 hours or overnight. The dough can be frozen up to a month. 6. On a lightly floured piece of parchment paper, roll out the dough to a 16 by 7-inch rectangle. 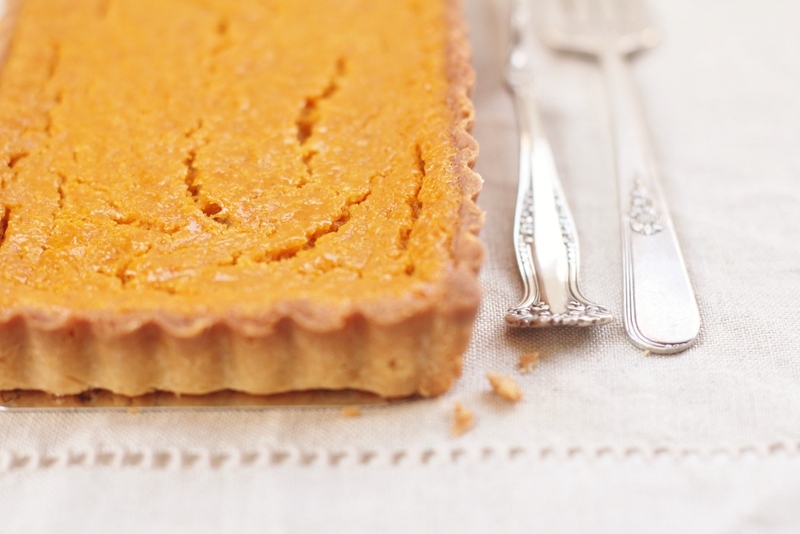 Fit the dough into a 14 by 4.5-inch tart pan and press it into the edges. Trim the overhang and discard. Put the tart pan into the freezer for 15 minutes. 7. Remove the tart pan from the freezer and place a piece of parchment paper over the dough and fill with pie weights or dried beans. Bake until the edges are just beginning to turn golden, 15-20 minutes. 8. Remove parchment and weights. Return crust to the oven and continue baking until light golden all over, another 15-20 minutes. Cool completely on a wire rack. 2. Beat mascarpone cheese until smooth. Add kuri squash puree, egg, sugar and the spices. Add flour and vanilla. Beat together until well combined. 3. Pour into crust. Spread out evenly and place oven for 45-60 minutes until the surface starts to crack. 4. Remove from the oven and let sit for 15 minutes. Refrigerate for 4 hours or overnight.